Wash strawberries and let dry completely. Melt chocolate almond bark in a bowl according to package instructions. 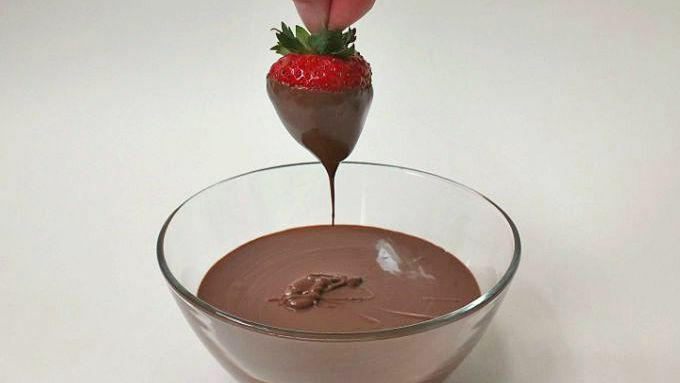 Hold strawberry by stem and dip into chocolate. 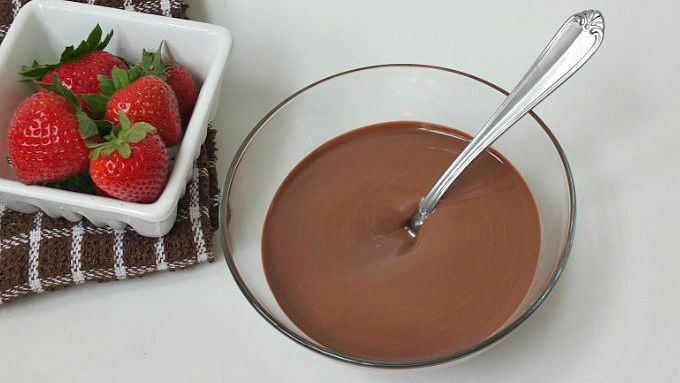 Pull strawberry out of the melted chocolate and let the excess drip into the bowl. Place the chocolate strawberry on parchment paper. 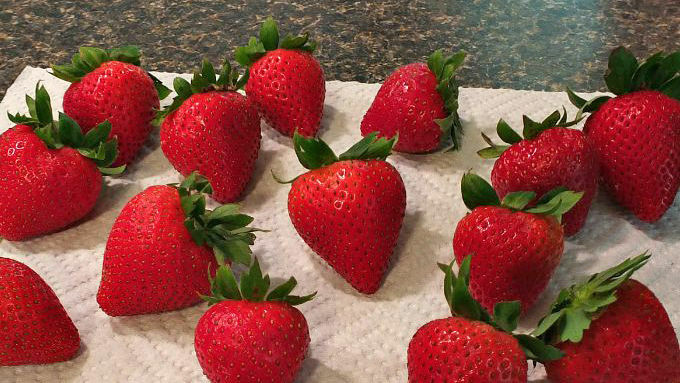 Repeat with all strawberries, then place in the refrigerator for 15 minutes to set. 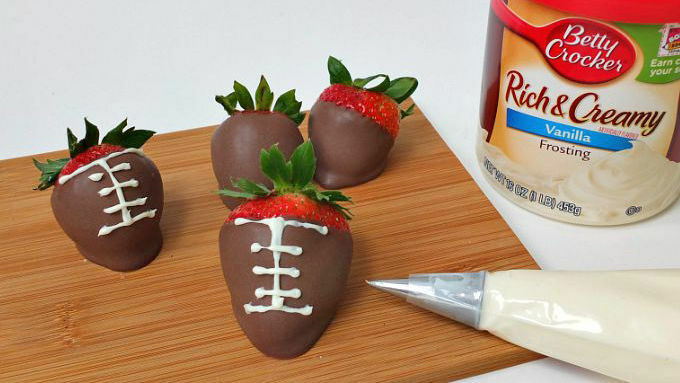 Using a narrow icing tip or a plastic bag with the corner snipped off, pipe frosting football laces on each chocolate dipped strawberry. 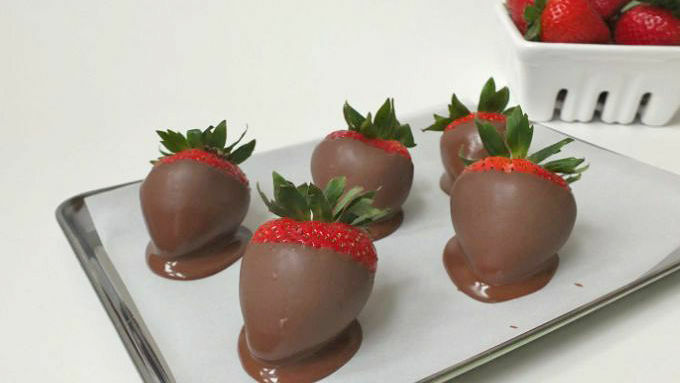 Make sure the strawberries are thoroughly dried or the chocolate will seize. When I think of chocolate-dipped strawberries, I think romance. These football-themed treats will the first down at any game day party! And then I remember how much I love my favorite football team, so it’s pretty much is the same thing. Let’s face it —there are lots of chips and dips, wings and things to munch on while watching the big game. Savory snacks are always on the menu, but sometimes you crave a little fruit or something sweet. 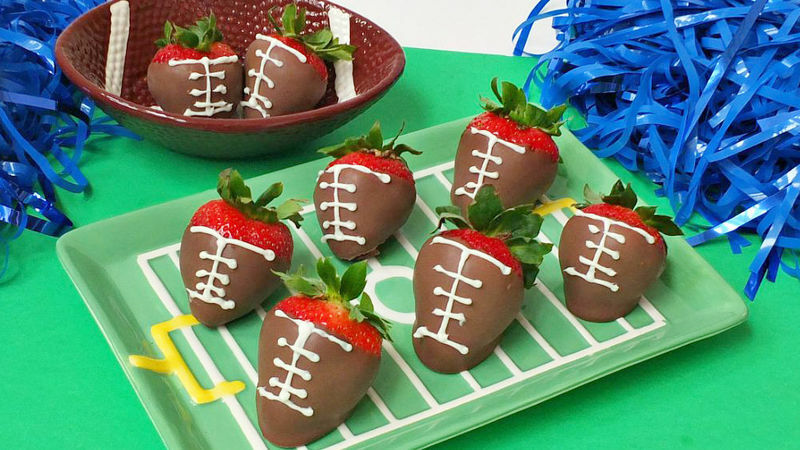 These chocolate-dipped strawberries decorated to look like little footballs are the perfect answer to a sweet snack—that will be gone in a snap! Here’s the game plan: Grab some strawberries, chocolate almond bark and some frosting. Wash your strawberries, and make sure they are dried. I mean DRIED. If there is ANY water on them whatsoever, your melted chocolate will seize and everything will turn into a horrid gloppy mess. I cannot confirm or deny that this has happened to me before. Just trust me. Pipe on the laces with frosting to make them look like footballs. Victory, sweet victory!